Well done to the five lucky winners of Imperial Cars latest competition in conjunction with Northampton Town FC. Greg Myles, Adam Clark, Ty Wootton, Dan Redding and Ian Kirton provided the five closest guesses for the attendance of the Northampton Town FC vs Charlton game on 4th March. The winners were invited along with their guests to enjoy a hospitality evening for the Northampton Town FC vs Port Vale game which took place on Tuesday night. In addition to watching the match, the guests were treated to a tour of the stadium, dinner with pre-match entertainment including competitions and games, tea, coffee and desserts at halftime and post-match presentations. Imperial Cars are proud sponsors of Northampton Town FC. 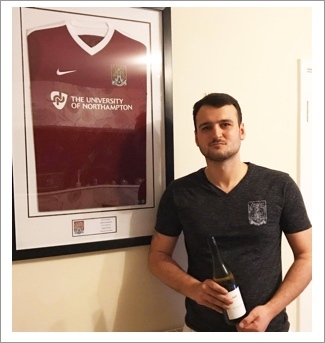 Below is a photo of Dan with the NTFC shirt he won at the dinner table raffle.